Multi-Sector Partnerships – The Key to a Brighter Future? Blackrock CEO Larry Fink wrote a letter this year that shook the business world. Fink, CEO of one of the most influential investment management companies in the world, urged CEOs around the world to take responsibility and action for their company’s social impact. Both public and private companies should serve a social purpose. But can they, should they, be expected to do this on their own? Social impact does not exist in a vacuum. If we’re to overcome ongoing socio-economic and political crises, it’s going to take a unified approach. A brighter future for humanity is going to require collaboration – between individuals, and between sectors. Last week, Realized Worth had the pleasure of visiting our friends at Concord Hospitality. 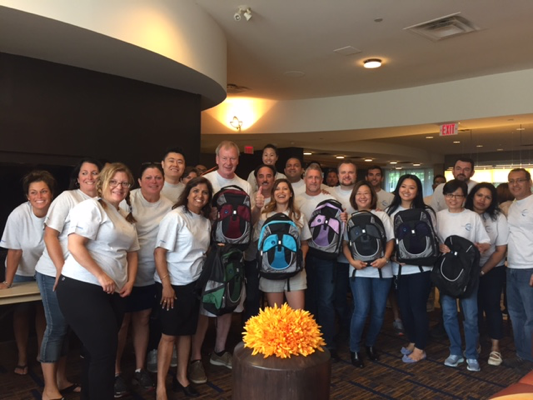 As part of their 10th annual Share Day, in partnership with Feed the Children, Concord associates gathered to build backpacks for 600 kids as part of Feed the Children’s Homeless Education and Literacy Program (H.E.L.P). For this event, Feed the Children worked with local Canadian nonprofit partners such as Speroway in Burlington, Good Shepherd in Hamilton, Hope House in Guelph and Food for Life in Burlington. Feed the Children’s H.E.L.P. program supports homeless families who struggle with access to adequate educational supports for their children, and helps homeless youth who struggle to gain continuous access to education. This program has helped more than a million children in North America attend and succeed at school. Since starting Share Day in 2009, Concord Hospitality associates have raised more than $700,000, donated over 24,000 hours of service, distributed 2 million meals to 22,000 families and refurbished over 20 homes. In this one event, Concord Hospitality and their partners contributed time and energy toward lessening the negative impact of multiple societal issues, including poverty, homelessness and education. These issues fold up into the 17 Sustainable Development Goals (SDGs) developed by the UNDP, and are agreed upon by 193 member states to be achieved by 2030.It’s also events like these that show how companies can engage their employees to take part in achieving the goals through volunteerism. Which is where IMPACT 2030 comes in. II. What is IMPACT2030 and Why Should Companies Join? Led by the private sector, in partnership with the UN, IMPACT2030 is a privately-led initiative in collaboration with academia, noble houses, nonprofit organizations and government to impact the 17 SDGs by 2030. This will be achieved by leveraging the human capital of corporate volunteers, by forming action teams in a multi-sector approach. For example, IMPACT2030 partners Telefonica, CaixaBank and SAP formed an action team in Madrid, Spain to support social entities that favored employability. Over a period of 15 days, 12 employee volunteers contributed their knowledge, experience and time to four Foundations, focusing on SDG #8 which seeks to promote decent work and economic growth. On September 5-7, 2018, IMPACT2030 partners and stakeholders will gather at the UN for the biennial Global Summit where action teams like this will share their achievements and challenges, while continuing to foster new partnerships to affect the Global Goals. III. 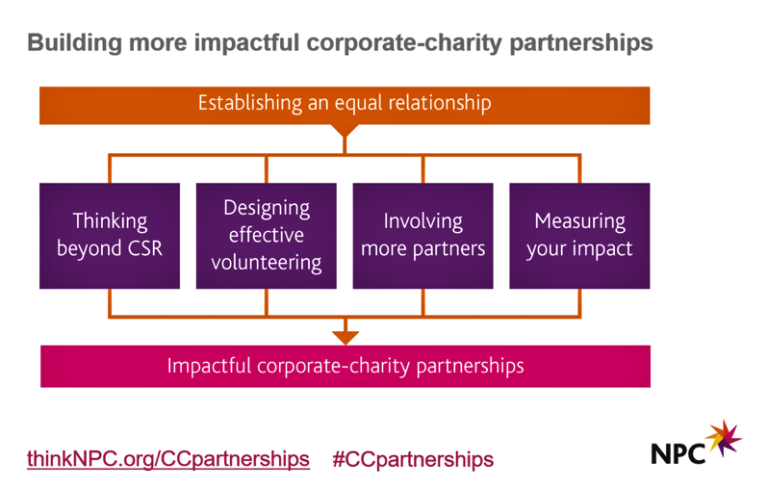 Partnerships Are Hard: How Can Different Sectors Partner Successfully? Although there are many examples of successful multi-sector partnerships, often strong, sustainable partnerships are difficult to develop and maintain. Needs are not aligned, different languages are spoken (figuratively and literally), resources are unbalanced and we still adhere to the model of creating value for, rather than with society. How do we move past this and develop effective, powerful and balanced partnerships that benefit all stakeholders? Tropical Health and Education Trust (THET), developed their Principles of Partnership. This amazing resource dives in to the 8 steps you can follow to build successful partnerships. It provides step by step guidance and downloadable resources and materials. 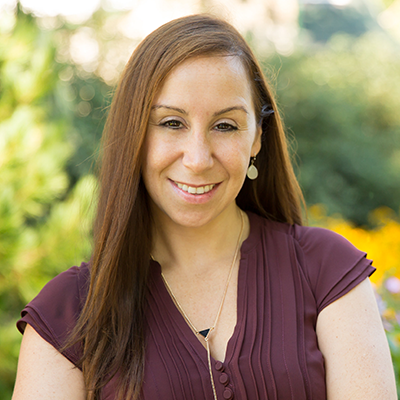 Partnership experts can help to guide and facilitate your new relationships, but there is also an abundance of research at your fingertips to get you started. IV. Why Does Volunteering Matter? When companies provide opportunities for employees to volunteer, not once a year, but over and over again, employees are often brought into situations where they interact with people who may not belong to their typical “in-group.” Volunteering asks employees to challenge their assumptions about the world and about themselves – their preconceived notions of what it means to be “equal,” to be part of the same community. It is through these sensemaking experiences that people begin to truly listen to the stories of others. Volunteering can start to help people understand, accept and honor differences. Our empathy circles are expanded. The issues affecting others start to belong to everyone ­– it’s no longer us vs. them. It’s just “us.” When we gather the right players, align our missions and work together towards a common goal, this is where real change for a brighter future begins. Realized Worth is a global agency that specializes in employee volunteer training, volunteer program design, and employee engagement. Call us at 1-855-926-4678 to discuss partnership opportunities for your company, or shoot us an email. You can also reach out to us on Facebook and Twitter.